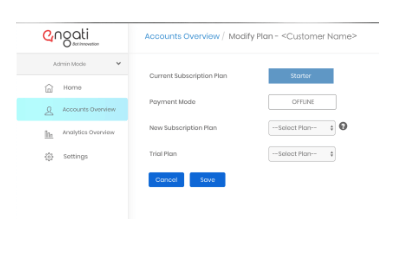 Engati has recently introduced 2 new release features on its platform. The contextual feature will allow the user to have an informal conversation with the chatbot. The intent in each message will be identified by the bot and carried forward across multiple messages. Therefore, the user will not have to specify the context in a message/question every time. User: When can I start the machine learning course? User: What about the fee? Although the second question doesn’t mention the specific course, the bot is smart enough to understand that the user is talking about the Machine Learning course (taken from the previous message). This is established by tagging the name of the course as an “intent” and carried forward until a new intent is established that replaces the Machine Learning course.The feature has been intelligently built so that the bot can have a conversation with the user just like humans process a conversation. A partner can now onboard a new customer with a single click. An email invite is sent out to the new customer to register. Once registered, the customer can be managed using the administrative portal. A partner can modify a customer’s subscription plan based on their business needs. A partner can monitor the platform utilisation by leveraging analytics around bots and interactions. You can access the analytics either at a customer level or at a bot level. The new release is available for all partners who have enrolled either as a Reseller or Affiliate with Engati. Register with us to know more about Engati & chatbot technology.